Paint Aprons | Anthony & Co. 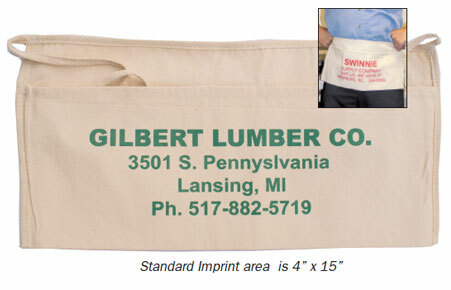 These heavy duty aprons will keep your message on the job every day. 950 Waist apron is made of natural heavy 10 oz. duck cotton and is 8" x 18" with 2 nail pockets and pencil pocket. 952 Waist apron is made of 10 oz. duck with Poly-Pro binding Tie Strings, 2 nail pockets and pencil pocket. For new artwork containing your business logo, standard paint manufacturers logo and business information - $43.75 (V). For all repeat orders - $18.75 (V). Less than minimum charge - $31.25 (V). Hammer loop - $.19 (V) each. Pencil pocket - Included. Second color available for additional $.38 (V) each, plus $43.75 (V) screen charge. Less than minimum charge - $25.00. We reserve the right to ship and invoice +/- 10% of quantity ordered. Your imprint available in Black, Yellow-012, Red-186, Warm Red-179, Silver Grey-430, Kelly Green-341, Hunter Green- 336, Spruce Green-5535, Neon Pink-806, Neon Orange-804, Gold-1235, Orange-1665, Royal Blue-2748, Neon Green- 802, Purple-269, Neon Yellow-809, Process Blue-307, Mono Blue-300, Reflex Blue-280, Neon Blue-801, Maroon-195, Navy-289, Olive Green-5743, Brown-476, Gold Metallic-871, Silver-877. 953 Waist apron is made of colored poly-cotton twill material and is 8" x 18" with 2 flared nail pockets. Great looking aprons at a great price. Available in Royal Blue-287, Sailor Navy-2767, Kelly Green-348, Hunter Green-350, Olive Green- 5815, Teal-3155, Athletic Gold-1235, Red-187, Pink-203, Purple-269, Yellow-107, Brown-412, Black and Natural. See above for imprint colors.